The Guelph Storm are a major junior ice hockey team based in Guelph, Ontario, Canada. They have played in the OHL since the 1991–92 season. 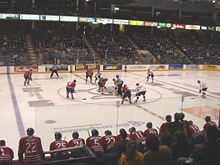 The team plays home games at the Sleeman Centre. The franchise started as the Toronto Marlboros, who moved to Hamilton to become the Dukes of Hamilton in 1989. Following the 1990–91 season, the franchise was relocated to Guelph and a contest was held to name the team. Tom Douglas submitted the winning entry "Storm" and the team was renamed the Guelph Storm. The first year in Guelph was dismal, but the building process for Guelph was soon successful. The Storm finished first place in the 1994–95 season. General Manager Mike Kelly was voted the OHL Executive of the Year and Craig Hartsburg voted the Coach of the Year for the Canadian Hockey League and the Ontario Hockey League. Draft picks from the early years in Guelph include Jeff O'Neill and Todd Bertuzzi. Guelph reached the OHL finals in 1995 and 1996. The team qualified for the 1996 Memorial Cup by playing against the Memorial Cup host Peterborough Petes in the OHL final. The Storm won their first J. Ross Robertson Cup in 1998. This success continued into the Memorial Cup Tournament as the Storm rallied to the Championship Game where they lost to the Portland Winter Hawks in overtime in the final game. In the year 2000, the team moved from the historic but aging Guelph Memorial Gardens into the Guelph Sports and Entertainment Centre (since renamed the Sleeman Centre). The Storm were selected to host the 2002 Memorial Cup tournament. It marked the team's third appearance in the national junior championship, their first as host team. Two years later, the Storm won their second OHL Championship, and returned to the 2004 Memorial Cup hosted in Kelowna, British Columbia. In 2014, the Storm captured their third OHL Championship, and subsequently advanced to the 2014 Memorial Cup final, hosted in London, Ontario. In the 2008 NHL Entry Draft, defenceman Drew Doughty was selected 2nd overall by the Los Angeles Kings, the highest ever selection of a Guelph Storm player. The Guelph Storm have appeared in the Memorial Cup tournament five times, won the J. Ross Robertson Cup three times, won the Hamilton Spectator Trophy four times, and have won five division titles. Craig Hartsburg was awarded the Matt Leyden Trophy as the OHL Coach of the Year for the 1994–95 season, and was also voted the Canadian Hockey League Coach of the Year. He is a former NHL defenceman with the Minnesota North Stars. He has also been the head coach of the Chicago Blackhawks, Mighty Ducks of Anaheim, Ottawa Senators as well as the Sault Ste. Marie Greyhounds. He has twice been an assistant coach with the Philadelphia Flyers. Dave Barr coached the team from 2004–08, and won the Matt Leyden Trophy in 2005–06. List of coaches with multiple seasons in parentheses. 18 – Paul Fendley, a former member of the Guelph CMC's who died in an on-ice accident at Guelph Memorial Gardens in 1972. His number has not been issued to a player since, by the Guelph CMC's, Guelph Platers, or Guelph Storm. The number was officially retired in a ceremony before a November 15, 2008 game. 1991–92 – Out of playoffs. 1992–93 – Lost to Detroit Jr. Red Wings 4 games to 1 in first round. 1993–94 – Defeated London Knights 4 games to 1 in division quarter-finals. Lost to S.S.Marie Greyhounds 4 games to 0 in division semi-finals. 1994–95 – First place in OHL. Earned first round bye. Defeated Owen Sound Platers 4 games to 0 in quarter-finals. Defeated Belleville Bulls 4 games to 0 in semi-finals. Lost to Detroit Jr. Red Wings 4 games to 2 in finals. 1995–96 – First place in OHL. Earned first round bye. Defeated Niagara Falls Thunder 4 games to 0 in quarter-finals. Defeated Belleville Bulls 4 games to 1 in semi-finals. Lost to Peterborough Petes 4 games to 3 in finals. Finished 4th place in Memorial Cup hosted by Peterborough Petes. 1996–97 – Defeated Erie Otters 4 games to 1 in division quarter-finals. Defeated S.S. Marie Greyhounds 4 games to 2 in quarter-finals. Lost to Ottawa 67's 4 games to 3 in semi-finals. 1997–98 – First place in OHL. Earned first round bye. Defeated Sudbury Wolves 4 games to 0 in quarter-finals. Defeated Plymouth Whalers 4 games to 0 in semi-finals. Finished round-robin portion of Memorial Cup in 2nd place. Defeated Spokane Chiefs 2–1 (OT) in semi-finals. Lost to Portland Winter Hawks 4–3 (OT) in finals. Finished 2nd place in Memorial Cup. 1998–99 – Defeated Erie Otters 4 games to 1 in conference quarter-finals. Lost to Owen Sound Platers 4 games to 2 in conference semi-finals. 1999–2000 – Lost to Plymouth Whalers 4 games to 2 in conference quarter-finals. 2000–01 – Lost to Brampton Battalion 4 games to 0 in conference quarter-finals. 2001–02 – Defeated Kitchener Rangers 4 games to 0 in conference quarter-finals. Lost to Windsor Spitfires 4 games to 1 in conference semi-finals. Finished round-robin portion of Memorial Cup tied for third place. Lost to Victoriaville Tigres 4–3 in tiebreaker game. Finished 4th place as hosts of Memorial Cup. 2002–03 – Defeated Sarnia Sting 4 games to 2 in conference quarter-finals. Lost to Kitchener Rangers 4 games to 1 in conference semi-finals. 2003–04 – Defeated Owen Sound Attack 4 games to 3 in conference quarter-finals. Defeated Plymouth Whalers 4 games to 0 in conference semi-finals. Defeated London Knights 4 games to 3 in conference finals. Finished 4th place in Memorial Cup hosted by Kelowna Rockets. 2004–05 – Lost to London Knights 4 games to 0 in conference quarter-finals. 2005–06 – Defeated Saginaw Spirit 4 games to 0 in conference quarter-finals. Defeated Plymouth Whalers 4 games to 2 in conference semi-finals. Lost to London Knights 4 games to 1 in conference finals. 2006–07 – Lost to Plymouth Whalers 4 games to 0 in conference quarter-finals. 2007–08 – Defeated London Knights 4 games to 1 in conference quarter-finals. Lost to S.S. Marie Greyhounds 4 games to 1 in conference semi-finals. 2008–09 – Lost to Saginaw Spirit 4 games to 0 in conference quarter-finals. 2009–10 – Lost to London Knights 4 games to 1 in conference quarter-finals. 2010–11 – Lost to Saginaw Spirit 4 games to 2 in conference quarter-finals. 2011–12 – Lost to Plymouth Whalers 4 games to 2 in conference quarter-finals. 2012–13 – Lost to Kitchener Rangers 4 games to 1 in conference quarter-finals. 2013–14 – Defeated Plymouth Whalers 4 games to 1 in conference quarter-finals. Defeated Erie Otters 4 games to 1 in conference finals. Finished round-robin portion of Memorial Cup in 1st place. 2014–15 – Defeated Owen Sound Attack 4 games to 1 in conference quarter-finals. Lost to S.S. Marie Greyhounds 4 games to 0 in conference semi-finals. 2015–16 – Out of playoffs. 2016–17 – Out of playoffs. 2017–18 – Lost to Kitchener Rangers 4 games to 2 in conference quarter-finals. For the 2007/08 season, the team switched to a crimson and white colour scheme with the same logo that was on the last jerseys, except the "stripes" that appear across the "belly" of the Storm logo itself were modified from black to crimson. The white jersey has "STORM" written on top of the logo, and the crimson jersey has "GUELPH" above the logo. The new shoulder patches, featuring the alternate "GS" logo, have been redesigned and are meant to be read from the inside (the "G") outward (the "S"). The Guelph Storm primary logo is one of the team’s mascots "Spyke" surrounded by a twister with the team name above it. The team colours are white, grey, crimson and black. Home jerseys have a white background with "STORM" above the logo, and away jerseys have a crimson background with "GUELPH" above the logo. The previous Guelph Storm logo (inset right) was used from 1991 to 1995. The team colours then were white, blue, grey and black. Home jerseys had a white background and away jerseys had a blue background. The Guelph Storm played at the Guelph Memorial Gardens from 1991 until the year 2000 when moving to the new Guelph Sports and Entertainment Centre, since renamed the Sleeman Centre. The GSEC was built into what was a former Eaton's department store in a downtown shopping mall. The GSEC hosted the 2001 Hershey Cup and the 2002 Memorial Cup. Profiles and photos from "The OHL Arena & Travel Guide:"
Wikimedia Commons has media related to Guelph Storm.